ACROSS BRUSH CREEK from the village of Manor, in Westmoreland County, Joseph Mathias built a distillery in the mid- to late-1800's and operated it there for many years as the J. Mathias & Co. Distillery. In 1878 he was joined by a partner and the distilling company was identified on labels as Fry & Mathias, although the distillery itself was always known locally (and on its bonded warehouse sign) as the J. Mathias Distillery. The distillery burned down in 1882, but was immediately rebuilt. The new plant included a 3,000-barrel capacity warehouse, twice the size of the older one. As with many distilleries, then and now as well, their operation included a pig-feeding facility, as a profitable way to dispose of the spent grain mash. In our searches we've learned that, in order to find the old sites once occupied by distilleries, one should locate a river or creek near the town, then look downstream for the distillery site. If you find a place where pigs were known to have been raised, you've got your distillery location. In this case, though, when we visited the site where Fry & Mathias once distilled fine rye whiskey, finding the location was made very easy for us. We enjoyed the expert guidance of a former Manor resident. One of our readers, several months ago, contacted us when he saw the distillery mentioned on our Sam Dillinger page. He was familiar with the distillery in Manor and asked if we knew anything more about it. He sent us details of where it was located, including street names. Using the Google Earth program, we were able not only to find it, but to take a virtual tour of the area. When we actually visit the site in June of 2006, we feel as if we're returning to a long-familiar scene. So thank you, Jack, for your invaluable assistance. 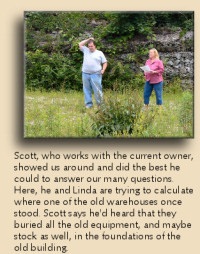 More assistance comes from Scott, who works at the pest control firm now occupying part of the site. Having grown up in the area himself, Scott is also familiar with the Mathias distillery and he walks around with us to show us details (and also to make sure we don't get eaten by snakes). Thank you too, Scott. The old warehouse, which is the only surviving building, is owned by a machine shop. 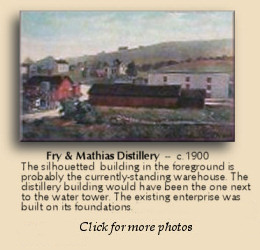 Fry & Mathias began as primarily a wholesale whiskey vendor, producing whiskey for sale in bulk to other distillers and merchants. 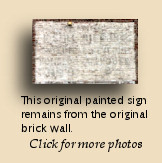 Early advertisements guaranteed prompt delivery of all orders received by phone or mail, which, in those pre-internet days, were not normally thought of as methods of retail purchase. Later, however, they marketed their own brands. 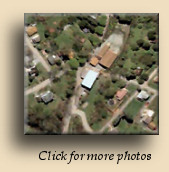 Those included "Old Manor" and "Old Westmoreland". The distillery closed in 1920 with the onset of national prohibition, but the "Old Westmoreland" brand was brought back after Repeal by nearby Ruffsdale Distillery. 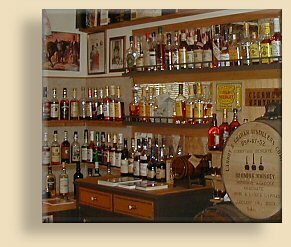 Looking for more about American Whiskey? Story and original photography copyright © 2006 by John F. Lipman. All rights reserved.